Both the unblogged photos in my “Singapore” folder and my friend DoublyHappy’s fabulous Singapore photos have given me a swift kick in the booty – I need to finish my Singapore posts! Additionally, I’ll be returning to Singapore next month to take even more food pictures, so I’ve got to clear my current backlog. Next month I’ll be posting about some of the special Chinese New Year foods in Singapore, so stay tuned! But first, I’d like to share with you the wonderful world of roti prata. 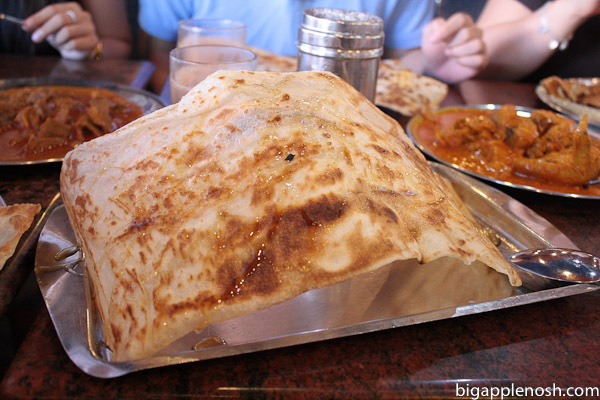 Singapore’s demographic mix of Chinese, Malay, Indian and Eurasian leads to a plethora of food options and variety, with roti prata being a prime example. 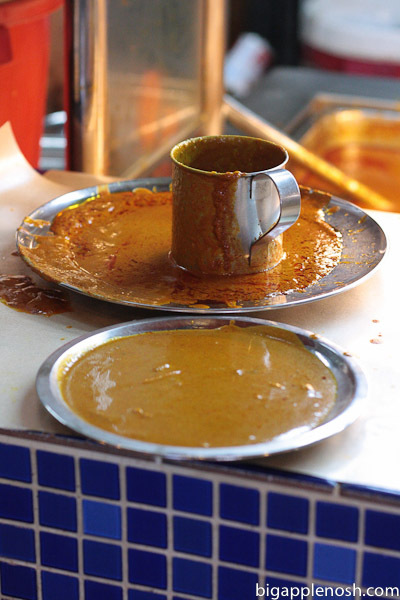 The honey prata was about 2 feet in length and almost a foot in width – quite a daunting task. Haphazard splashes of honey adorned this crumbly concoction, and I dug right in. It was crispy, hot and sweet – so yummy! One thing that did slow me down a bit was the standard utensils – fork and spoon and absolutely no knife to rely upon. It was a bit slow going; however, I powered through it and finished the honey prata like a champ. 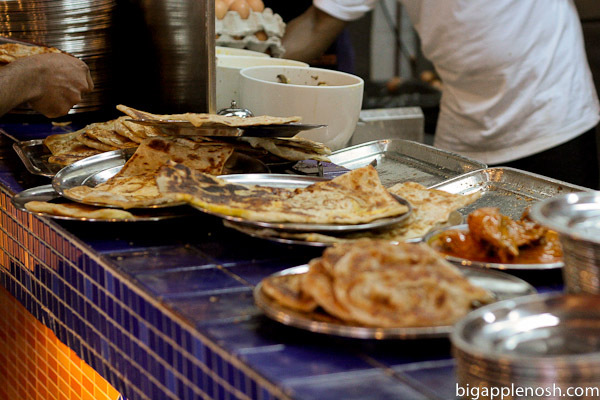 The variety and just plain yumminess make it prata a must-try snack if you visit Singapore. I’m looking forward to sampling even more varieties when I return next month! What roti flavor would you like to see? There are ONLY forks and spoons in food courts here! I had to practice a lot to use the spoon as a knife. 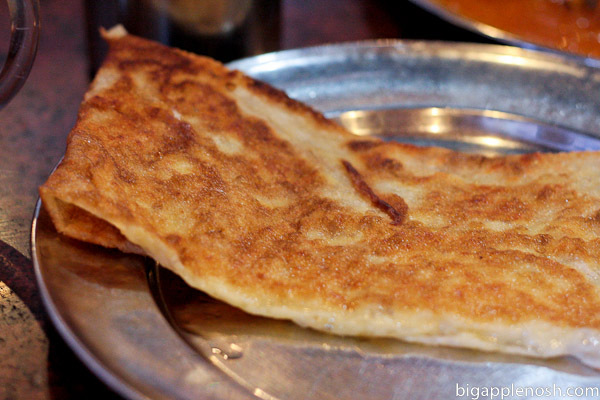 You're making me miss roti prata now – perhaps I'll have it this weekend! Roti Prata is so yummy! I've never sen the dessert ones you mentioned, but they look delicious and I'm dying to try them! yum! 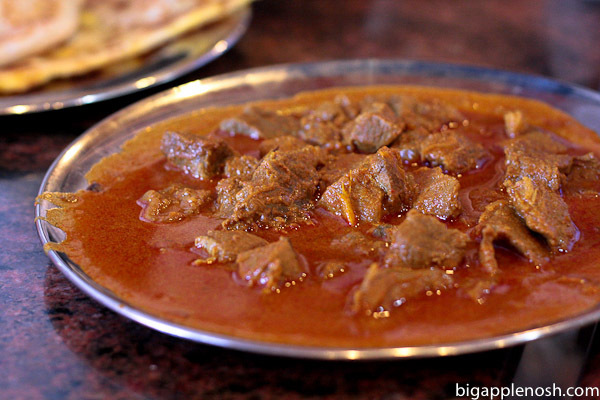 the mutton curry sounds so good. Um..that honey prata looks so delicious! I want to dive right in! Tasty! Can't wait to see more from your upcoming trip! ooh roti prata is so good. I like the fluffy ones in thin layers that rise up. i've never tried roti but am now adding it to my list of foods to try. Love Roti! Might have to hit up Flat Top Grill this weekend to get my Americanized fix. I love roti canai. I've never tried the sweet ones, but I would totally dig the honey covered roti. I'm pretty sure you could cover cardboard with honey and I'd still think it's delicious. Can't wait to hear about your upcoming trip! My aunt and grandpa will be in Singapore for New Year's too. whoa, all that sauce looks so good. after the bread was done i'd be licking the plates clean. 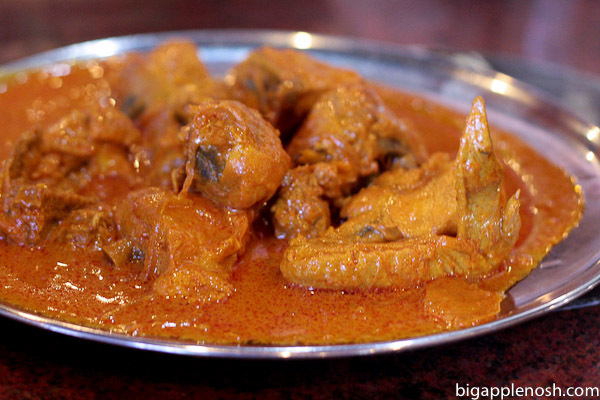 All these blogs on Singapore food… i need to start planning a vaca there! I really need to have this in my life! 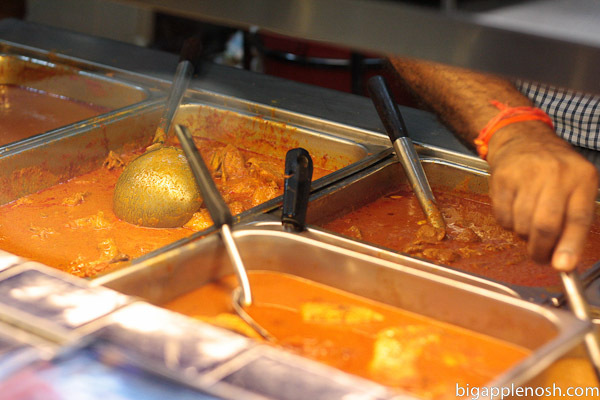 Mmmm, roti with curry, delicious! This looks delicous. I love roti with Malaysian food. Mmmm this sounds really interesting and yummy! I looove roti, have you tried the paper thin dosa? I like that too, but I love the chewy texture of roti even more..